Construction of the factory in Cherbourg is due to begin next month and operations will commence in June 2018, the Danish firm said. The new factory will be able to produce LM's 88.4-metre offshore wind blades, revealed in June last year. The world's longest turbine blade was designed for Adwen's 8MW offshore wind turbine, which has a pipeline of approximately 1.5GW in France. LM said the decision to build in France followed an agreement with new parent-company GE for the supply of the 73.5-metre blades for its 6MW Haliade turbine. GE's Haliade turbine – acquired in its takeover of Alstom in 2015 – also has roughly 1.5GW under order in France, with a further supply deal in the Netherlands. "This blade factory project for the offshore wind market in Cherbourg benefits from strong support from the Normandy authorities. 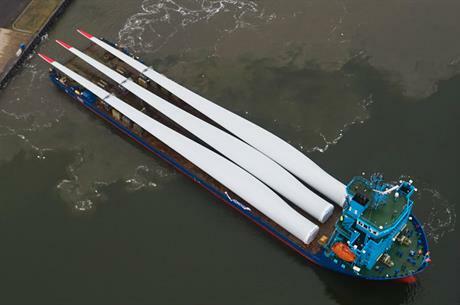 Ports Normand Associes (PNA) has invested heavily to prepare the port in order to welcome industrial companies such as LM Wind Power to develop renewable marine energy," the blade firm said. GE's €1.5 billion takeover of LM Wind Power was announced in October. The US manufacturer, which has its renewable energy headquarters in France, said it intends to operate the blade manufacturer as a "standalone unit" under its renewable energy business.